It's happened to all of us. You sit down to watch the sequel to a movie which you most certainly saw, and it doesn't take long for you to realize that you don't remember anything about that first movie. And, of course, this sequel doesn't contain a recap or anything else to help jog your memory. It's almost like "movie amnesia", as you know that you watched the previous movie, but any specific details about the story escape you. So, you muscle through and hope that this new movie has enough charm to succeed on its own. This was my experience while watching The Huntsman: Winter's War. The Huntsman: Winter's War starts as a prequel to Snow White and The Huntsman. Sisters Freya (Emily Blunt) and Ravenna (Charlize Theron) live in a huge castle, where Ravenna uses her magic mirror to rule the land. Freya has a child with a secret lover, who immediately turns his back on the young woman. Things get even worse when the baby is killed. Freya's grief leads her to discover that she has the power to freeze things. She then moves to the north, where she creates an empire of ice. As she lost her child, she takes all of the children from the region and raises them as warriors. Two true champions emerge from this program -- Eric (Chris Hemsworth) and Sara (Jessica Chastain). When Freya sees that this pair are falling in love, she separates them. The film then becomes a sequel to Snow White and The Huntsman. Eric learns that Ravenna's mirror has been stolen. Fearing that Freya will get the mirror, Eric joins two dwarves, Nion (Nick Frost) and Gryff (Rob Brydon), on a quest to retrieve it. Along the way, they are joined by a pair of females dwarves (Sheridan Smith and Alexandra Roach), and a mysterious stranger whose fighting skills will be a key element of protecting the mirror. Given that Snow White and the Huntsman did not turn a profit at the U.S. box office, it's interesting to see that a sequel was made. It's even more interesting to note that this film has added even more impressive actors to the cast. (Blunt and Chastain did know that they were making a sequel to a movie that they were not in, correct?) (And I, for one, did not miss Kristen Stewart here.) And with The Huntsman: Winter's War, Writers Evan Spiliotopoulos and Craig Mazin have crafted a weird movie. The prequel part, in which we meet Freya and learn her story, is not necessarily original, but it is certainly interesting. (Although, I think that many viewers will be reminded of Elsa from Frozen.) I must admit that I was very surprised that the movie went where it did with Freya's baby, especially so early in the film. Her military camp for children was also a surprising touch. Again, none of this is ground-breaking, but for a PG-13 fantasy film, it was quite strong, and it was interesting to see Blunt playing such a "cold" villain. But, when The Huntsman: Winter's War became a sequel, it really went downhill. In short, the movie becomes a very cliched "sword & sorcery" movie at this point. Yes, we get Chris Hemsworth as a full-grown Eric, but we also get the quest to find the mirror and the group fighting goblins. The whole thing feels like deleted scenes from a Hobbit movie. The whole thing is clearly supposed to feel epic, but it simply doesn't, especially the finale. The ending of the movie wants to be a big fight scene involving all of the characters, but it's all decidedly generic and not the least bit interesting. There's no suspense or sense of danger and the fight sequences look like things which we've seen in many other movies. So, where did The Huntsman: Winter's War go wrong. The easy answer is that it forewent any sense of originality. Snow White and the Huntsman was by no means a great movie, but it took a very familiar and time-worn story and attempted to do something new with it. (And at least it was better than Mirror Mirror.) The Huntsman: Winter's War opens with a vicious attitude, but then backs away from this, allowing itself to become decidedly mediocre. The film's other problem is that four years may have been too long to produce this sequel. I probably wasn't alone in my feeling that I'd forgotten everything about the first film and this certainly shows in the box-office take. It's always great to see Hemsworth playing a cocky hero and Chastain proves herself worthy of being in an action movie, but they are placed in a story which has nowhere to go and that's not "fair" to anyone. 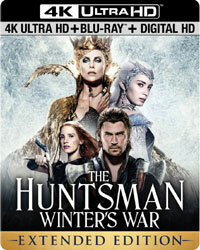 The Huntsman: Winter's War simply can't let it go on Blu-ray Disc courtesy of Universal Studios Home Entertainment. The film has been letterboxed at 2.35:1 and the Disc contains an AVC 1080p HD transfer which runs at an average of 34 Mbps. The image is very sharp and clear, showing no notable grain and no defects from the source materials. The colors are often muted in this film, but those which do appear look good, and although this is a dark movie, the image is never overly dark. The level of detail is impressive and the actors are nicely separate from the backgrounds. The Disc carries a DTS-HD MA 7.1 audio track which runs at 48 kHz and an average of 4.5 Mbps. The track provides clear dialogue and sound effects. It should be noted that is a below average bitrate for a 7.1 track. Still, the track is active, as we are treated to surround sound and subwoofer effects during the action sequences. The bass effects aren't especially powerful, but the rear channel action does offer some distinct sounds. This set also includes a Ultra HD Blu-ray where the film has been letterboxed at 2.35:1 and the movie is presented in true 2160p. I've only watched a few HDR discs thus far, but I've noticed that if the movie is dark, the sharpness doesn't necessarily leap out at you. This movie is a good example of this. Don't get me wrong, it looks great, but it doesn't look substantially better than the Blu-ray Disc. I've watched some 4K movies where the crispness was almost painful, but we do not get that here. The Huntsman: Winter's War Blu-ray Disc contains only a few extras. We begin with an AUDIO COMMENTARY from Director Cedric Nicolas-Troyan. "Winter's Vistas: The Making of The Huntsman: Winter's War" is a five-part offering consisting of "Two Queens and Two Warriors" (7 minutes), "Meet the Dwarfs" (8 minutes), "Magic All Around" (9 minutes), "Dressed to Kill" (6 minutes), and "Love Conquers All" (6 minutes). These segments take us on-set to see how various aspects of the film were created, such as the visual effects, the costumes, and the action sequences. Nicolas-Troyan features prominently here, and we also hear from the cast and the crew. The Disc offers four DELETED SCENES which run about 9 minutes and can be viewed with commentary from Nicolas-Troyan. These are all new scenes, but it's obvious that the film doesn't suffer from having had them cut. The final extra is a 10 minute GAG REEL.